Scroll below to see promotional material and exhibition installation shots. 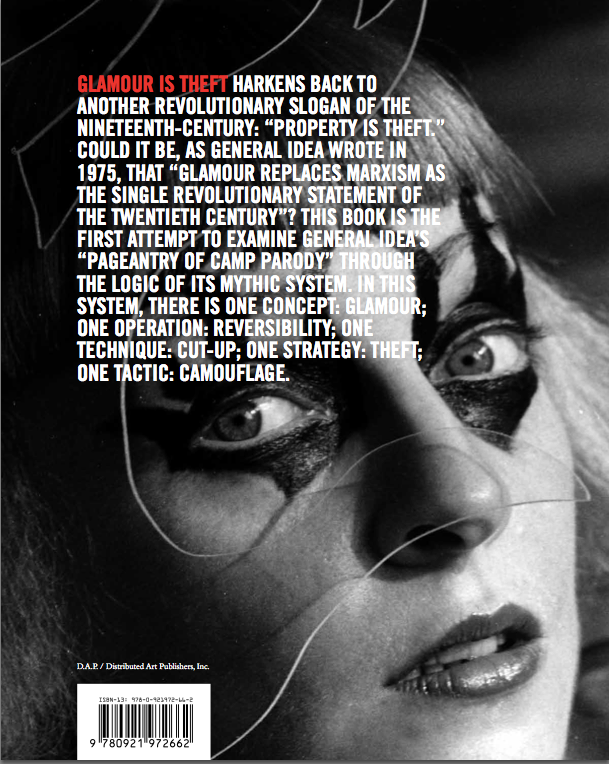 Back cover blurb: Glamour is Theft harkens back to another revolutionary slogan of the nineteenth-century: “Property is theft.” Could it be, as General Idea wrote in 1975, that “Glamour replaces Marxism as the single revolutionary statement of the twentieth century.” This book is the first attempt to examine General Idea’s “pageantry of camp parody” through the logic of its mythic system. In this system, there is one concept: Glamour; one operation: reversibility; one technique: cut-up; one strategy: theft; one tactic: camouflage. Glamour is Theft was written to mimic the strategies of General Idea but also to reflect the exhibition practices where two General Idea exhibitions from 1975 and 1977 were precisely recreated at the Art Gallery of York University. The exhibition followed my previous exhibition practice of “presenting events in retrospect.” So, in principle, nothing outside the timeframe of the original exhibitions would be considered as well in the book. This book was the first attempt to examine General Idea’s “pageantry of camp parody” through the logic of its mythic system. In this system, I discovered that there is one concept: Glamour; one operation: reversibility; one technique: cut-up; one strategy: theft; one tactic: camouflage. The arc of the exhibitions reflected the articulation and destruction The Pavillion: the destruction of the Pavillion was also the destruction of their system. Not only the books produced by the Art Gallery of York University, marketing material as well mimics the procedures of the exhibited artists and become an oblique form of interpretation rather than just standard didactic devices. On the one hand, this is one of the ways the institution itself performs copying the strategies of the artists the AGYU works with. On the other, you could look at it as an extended form of a writer's practice. Click to see teaser campaign. Click to see 1975, 1977, and 2009 installations.